Honduras is the second largest country in Central America and for some reason one of the least popular among travelers. That’s mostly because of all of the information out there about it being a dangerous country. However, as it happens in the rest of Central America, crime doesn’t affect travelers for the most part. You will probably find pickpockets and people trying to scam you but every country is like that. Some of its best attractions are located in Tegucigalpa, San Pedro Sula, La Ceiba, Copán and the Bay Islands. Some of the best activities you can take part in are exploring Mayan Ruins, hiking along the National Parks, snorkeling in the Caribbean Sea and relaxing in some paradisiac (and not crowded) beach. I have been to it with my family a couple of times and loved it every time. Here is some useful information about its currency and costs of traveling in Honduras. The Honduran Currency is called Lempira (HNL): One unit of Honduran currency is called the lempira. The Honduras Lempira is divided into 100 cents. Its symbol is an L.
- The bills come in eight different amounts: L1 (red), L2 (purple), L5 (dark gray), L10 (brown), L20 (green), L50 (blue), L100 (yellow), L500 (magenta). 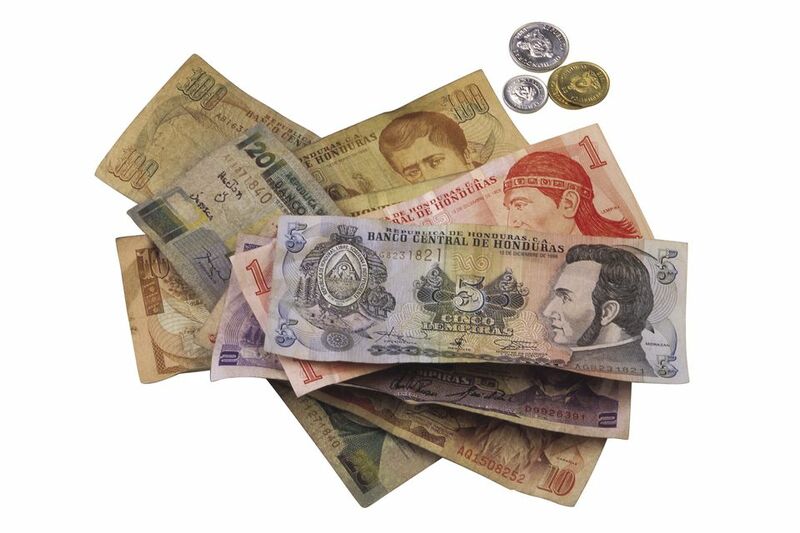 The exchange rate of the Honduran Lempira to the US dollar is approximately L23.5 to one USD, which means one Lempira is worth around USD 4 cents. For exact exchange rates, for the day you are reading this article visit Yahoo! Finance. The Honduras Lempira is named after a 16th-century ruler of the indigenous Lenca people, who led a resistance against the Spanish conquistadors. The lempira was introduced in 1931, replacing the peso at par. In the late 1980s, the exchange rate was two lempiras to the United States dollar. The US dollar is widely accepted in the Honduran Bay Islands of Roatan, Utila, and Guanaja you might even be able to use them in Copán. However, the rest of the country isn't too accepting of it. But keep in mind that you will be able to get more discounts at stores, restaurants and even in some hotels if you use the Lempira. Haggling is also almost impossible if you pay with dollars. Small businesses don't like having to go through the trouble of having to go to the bank and do the long lines to change the dollars. At Hotels – You will be able to find tons of budget dorms all over the country that charge around L200 per night. If you prefer to stay at cheap but private rooms you will spend between L450 and L700. You will also find a few more luxurious options, mainly in the Bay Islands and Copan that are still quite cheap. Buying Food – If you are looking for local dishes you can buy a full meal for around L65 at cheap local places. Restaurants cost slightly more at around L110. Transportation – To move around the cities you can use taxis but be careful to agree on a price before you hop in because they don't use meters. to move within cities you will have to use their buses (if you don't have a car) they are usually inexpensive at around L45. But keep in mind that they are not nice and comfy. Things to Do – Diving is likely to be the most expensive tour that you will find in Honduras. Most operators charge around L765 per person, per dive. Exploring the national parks is a much cheaper option. Most charge a fee of around L65. The Copán Ruins can also be expensive if you factor in entrance fee (220 HNL), entrance to the tunnels (240 HNL) and a guided tour (525 HNL).